I know you guys, it’s like: sweats after Thanksgiving. Groundbreaking. Hear me out. Everyone talks about what to wear TO Thanksgiving (myself included…here’s one of my favorites) but we don’t talk about what to wear after. I’m not saying go throw your pajamas on right away, but there’s a balance of looking casually relaxed AND still stylish. Here’s the case for sweatpants (when done right). I’ve never been a sweats out of the house kind of girl in my life. I’ll throw on jeans before I’ll reach for athleisure in my closet even if it’s running out to the store. The other day when my sister and I went across the street to get bagels, she was like why are you putting on jeans and cute boots to get bagels??? Sure enough, I ran into one of my styling clients in the shop! If I dressed like a hot mess, it would have been a reflection of me. Of course my job is fashion, but no matter what career you’re in, you never know who you’ll run into or meet. Maybe it’s the New Yorker in me, but you want to represent your best self, even if you’re just running errands. My mother instilled that in me. Other than late 80’s/early 90’s matchy track suits, we never wore sweats in or out of the house. Even as I write this, I’m wearing my father’s old sweatshirt from his 80’s sweatsuit—and it was DIOR. Don’t get me wrong, I like to be comfortable and I consider myself somewhat athletic, so I do have a drawer full of “athleisure.” I just typically wear it going from working out and then maybe to grab a coffee or grocery shopping on the way home. I recently purchased my first pair of cute sweats after styling this Alex and Ani shoot where I had to source tons of cute sweats for the cozy at home shots. It got me thinking that comfy sweats in the home that I actually wouldn’t mind being seen in. I accidentally wore them out of the house to grab something down the street from my car. (The horror!). When I posted on Instastories I couldn’t believe how many of you responded how you live in sweats or loved the ones I was wearing. Flash forward to when the NYC activewear brand AS YOU ARE reached out to me about working together right after this, it was a no brainer to try them out. 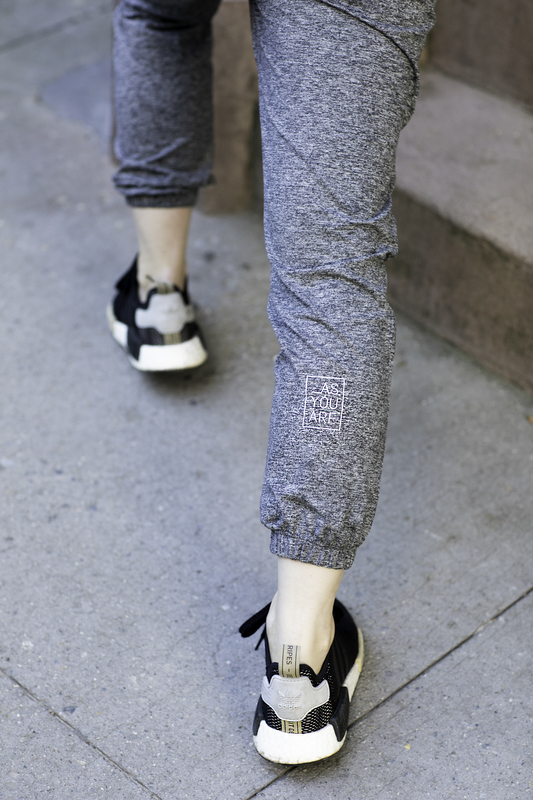 Sweats that are cute and made by New Yorkers? I’m in! It helps that they’re more tailored. To my surprise I even wore them getting manicures with Lydia after we shot this and she said this is THE perfect time to wear your sweats out of the house. She was right. Sign up on the email list to get $25 off your purchase on AS YOU ARE and get these cute sweats I’ve been living in (trust me they’re the softest and I’m going to be living in them after all the pie I’ll be eating this week. Happy Thanksgiving all!